At Software Toolbox, our technical support engineers take pride in the quality and speediness of their responses to your support incidents, including any issues you may have with licensing. Sometimes licensing issues don't happen during normal business hours (Murphy's law pretty doesn't help with that). 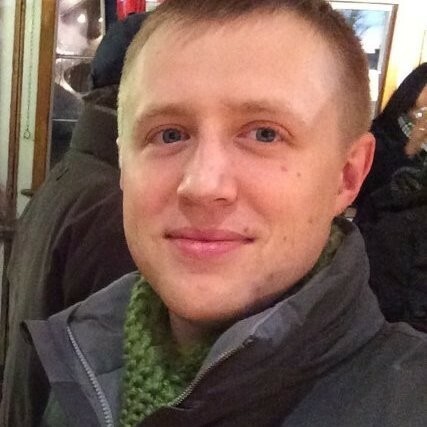 So what do you do if you've had a major hardware change or if one of your TOP Server machines has crashed unexpectedly outside of business hours and you need to get back up and running fast? Some users account for such situations, either by using hardware keys for TOP Server licensing or by having a hot backup server on another machine with a backup license (if you weren't aware of those options and are interested in what your options are - contact us). However, one tool that is included with every TOP Server license purchase at no additional cost is the Emergency Activation ID. An Emergency Activation ID is included with each purchased license specifically for use in the event of a machine/system failure occurring outside Software Toolbox normal business hours. 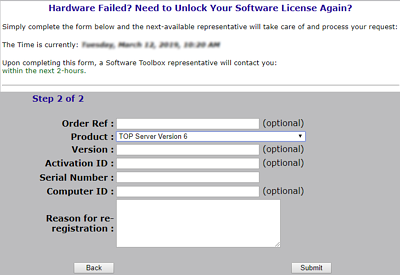 This Emergency ID can be activated through the Software Toolbox Registration website and allows the product to run for a period of seven days, giving you plenty of time to contact Software Toolbox technical support to get your permanent license restored by submitting a re-registration request. The Emergency Activation ID is a unique one-time use license: a separate Emergency Activation ID must be used for each product that requires emergency activation. If the TOP Server machine where the emergency license will be used does not have Internet access, just copy the activation request file to a machine that does have internet access to generate the activation response file. 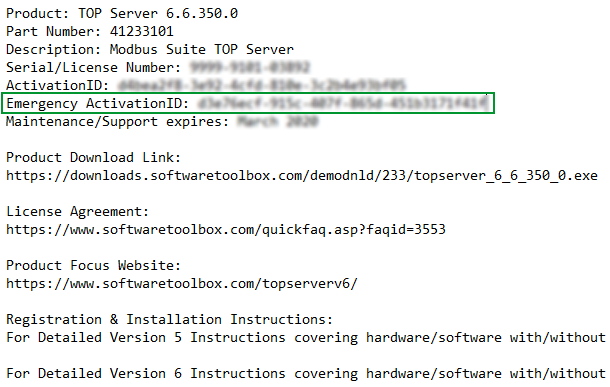 Both the activation request file and the activation response file must be processed on the actual TOP Server machine. The process is identical to how you activated your permanent TOP Server license. For full details on licensing your TOP Server, refer to our TOP Server activation how-to (we also include full instructions in the delivery of product email). 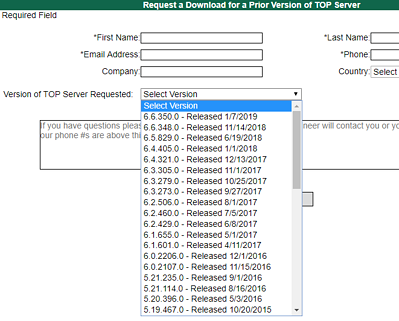 In case you don't have a copy of the installer for the specific version of TOP Server you need on your machine, in the case of a system failure requiring a re-installation, we have a special web page allowing you to download the version of TOP Server you need. So You're Emergency License is activated for 7 days - what's next? You'll want to submit a re-registration request to Software Toolbox through our registration website here. You'll be prompted for your contact information and then, in Step 2, for more details specific to your license. It's important to include as many details as possible to ensure our technical support engineers can easily find your license in our registration database and get back to you as quickly as possible when our offices reopen. Try to at least include your serial number and one of the activation IDs (Permanent or Emergency) which we can use to find other details. The process will involve either resetting your existing permanent Activation ID, reissuing a new permanent Activation ID, or other steps depending on several factors including your current support/maintenance status for the affected license and the reason for the re-registration (i.e. did the machine fail completely or will the license be reapplied to the same machine, etc). With the details you provide during the re-registration request, our engineers will easily be able to determine the best next steps to get your permanent Activation ID restored before the end of the 7 day Emergency ID period and get you a replacement Emergency ID to have in case of any future issues. And our offices are never closed for more than 4 or 5 days for a holiday, so you can be sure we'll get back to you well within that 7 day period. And last, but not least, it is important to discuss recovery procedures with all relevant personnel before a situation such as a machine or licensing failure occurs, as we've discussed above. To make sure you're prepared, it's a great idea to save copies of all current Activation IDs (including the associated Serial Numbers and Emergency IDs for each). That ensures that you'll have the information you need to not only get back up and running with your Emergency ID but also to provide our support engineers with all relevant details during the re-registration process. It is also helpful to note the correct version of the application's installation, especially in cases where you are running an older version for business or technical reasons. Making this sort of plan will ensure that any downtime you experience is minimal and you can get back up and running fast. Don't forget to subscribe to our blog to find out about the latest updates to TOP Server and for other useful tutorials and resources, including more Tech Support Corner posts like this one.